I've had a bit of eBay spree recently. 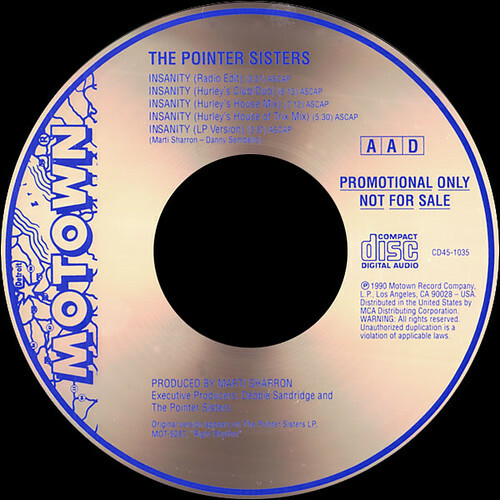 It means taking time to trawl through things (many of which are deeply disinteresting), but there are still some finds to be had, like this one: a promo CD with Steve 'Silk' Hurley mixes of a song by The Pointer Sisters. I had a hard time believing it was real to start off with. It wasn't on Discogs. It hadn't been posted anywhere on the web that I could find. A genuine find perhaps? You'd have thought that by now every single CD ever made would be available somewhere on the web, but that's not true. There are still quite a few things that are genuinely difficult to get your hands on. As a diligent music lover (and sharer, for the better good of mankind), I decided to create an entry for it on Discogs, which turned out to be not as difficult as I had thought, even if you do need to concentrate. You can consult it here. As it's rare, I thought you might like to download a copy of the CD. I've left off the album and single versions and just left the Hurley remixes, all in 256kbps AAC (indistinguishable from CD quality). You can get them here (41MB). The Pointer Sisters are still going by the way. They look mightily facelifted and/or photoshopped on their official site, which is fair enough: Bonnie Pointer is 60 now, Anita Pointer is 62 and Ruth Pointer is 64. Good for them. Interesting release, love these mixes too. Anyway, thank you so much for both. cool, je l'avais en 12" (la sortie domestique). je vais jeter une oreille sur le mix que je n'ai pas, asap. enfin dès que je pourrais. beautiful mixes. that's a triumphant ebay purchase...thanks so much for sharing them, you've got a lot of bpm karma coming!! Thank you so much for these! Been looking for this for ages! Pitty you omitted the radio edit (it's a Hurley mix too). Can I hope for a post of Hurley's radio, too? Love the feedback you give us on the releases you post! George.e, here's the radio edit. I think it's just a shortened version of one of the other mixes, but happy to help.